Nicknamed the "country of the upright people, full of courage and worthy of respect," landlocked BURKINA FASO is located at least 500 kilometers (311 miles) from the Atlantic Ocean in Western Africa. Previously known as Upper Volta before August 1984, Burkina Faso shares borders with 6 bordering countries: Benin (located to the southeast), Côte d'Ivoire (Ivory Coast; southwest), Ghana (south), Mali (north and west), Niger (east), and Togo (south). According to a government census in 2016, about 19,000,000 (19 million) people call Burkina Faso home. Independence from France was achieved on August 5th, 1960. Main agricultural produce, mined natural resources, and industrial goods include cotton, peanuts, shea nuts and shea butter, sorghum, corn, livestock, gold, manganese, limestone, marble, phosphates, pumice, salt, beverages, soap, and textiles. ● ● ● ● ● People and Places ● ● ● ● ● With about 2.27 million people (2017), the capital and most-populated city is Ouagadougou. Ouagadougou is considered a primate city in the state because of the following criteria: (1) it is the dominant financial and economic hub of Burkina Faso, and (2) there is not another city rivaling Ouagadougou's population. 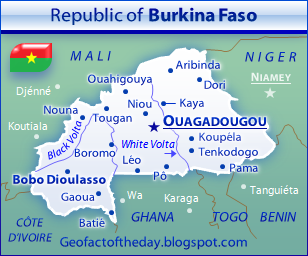 Other cities in Burkina Faso include Banfora, Bobo Dioulasso, Dédougou, Djibo, Fada-N'Gourma, Garango, Koudougou, Ouahigouya, Pouytenga, Tenkodogo, and Zorgo. Attractions and sites of interest throughout Burkina Faso include the Banfora Falls (Les Cascades de Banfora), Bobo Dioulasso Grand Mosque, Laongo Sculpture Symposium (Ouagadougou), Mare aux Hippopotames (Lake of Hippopotamuses) in Bobo Dioulasso, Nazinga Reserve, Ruins of Loropéni (blog post ↗), and Sindou Peaks (Les Pics de Sindou) in Banfora. While French is Burkina Faso's only official language used for government purposes, about 70 total languages are spoken throughout the state. According to Ethnologue (↗), the three recognized languages of national identity are Fulfulde (over 1,1870,000 people in B.F.), Jula (over 3,600,000), and Mòoré (over 6,400,000 Mossi people). Other major (and minor) languages and their respective ethnic groups/tribes — populations of communicators are listed in parentheses — include Birifor (110,000), Bisa (400,000), Buamu (270,000), Hausa (500), Koromfé (200,000), Lobi (220,000), Lyélé (215,000), Marka (140,000), Ninkare (25,000), Northern Dagara (250,000), Southern Bobo Madaré (185,000), Téén (2,000), and Zarma (600). About half the population believes in the tenets of Islam, followed by animist ethnic religions (30%), Christianity (almost 20%), and Bahá'í (0.03%). The Burkinabé people (people of Burkina Faso) use the West African CFA Franc (ISO 4217 currency code: XOF) as their currency. ● ● ● ● ● Land Features ● ● ● ● ● The generally flat country sits on a vast plateau and mostly includes grassy savanna land. With an area of about 16,000 km², Sahel Reserve is the country's largest park and the major protector of savanna habitat — the type of ecosystem suitable for large mammals and migratory birds. Three major north-south rivers — Black Volta (Mouhoun), Red Volta (Nazinon), and White Volta (Nakambé) from west to east — cut through the plateau's lateritic iron rock. The continuous savanna landscape transitions into here-and-there forests in southern Burkina Faso, especially south of Bobo Dioulasso city. Protected forestland and other areas of savanna land include the Arli National Park, Deux Bale Forest, Forest of the Mou, Kaboré Tambi National Park, Nakambé Forest, Singou Reserve, Sissili Forest, and W National Park. The transnational W National Park is named after the Niger River's W-shaped meander, located in southwestern Niger. 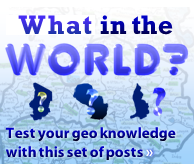 The lakes of Burkina Faso are certainly not as large as Lake Tanganyika, Lake Victoria, etc. However, several substantial lakes provide crucial water to people and animals. Burkinabé lakes include Bam, Dem, Higa, Kompienga, Oursi, and Tengrela. The country's first dam was constructed in the late 1980s on the southeast end of Lake Kompienga. Located along the Koulpeleogo (Koul Péolgo) river, the Kompienga Dam can generate up to 14 electrical megawatts (MWe) of energy for Ouagadougou and surrounding communities. Generating up to 16 megawatts of electricity, Bagré Dam was completed in the 1990s and later expanded to create a 7,000,000,000 m³ reservoir along the White Volta river. Finally, Burkina Faso's highest point is Mount Tena Kourou (Tenakourou). In the Cascades region of southwestern Burkina Faso near Mali, Tena Kourou stands 749 meters and 2,457 feet tall in elevation. This post was updated with more information on April 14th, 2017. The map of Burkina Faso was added on June 13th, 2017.